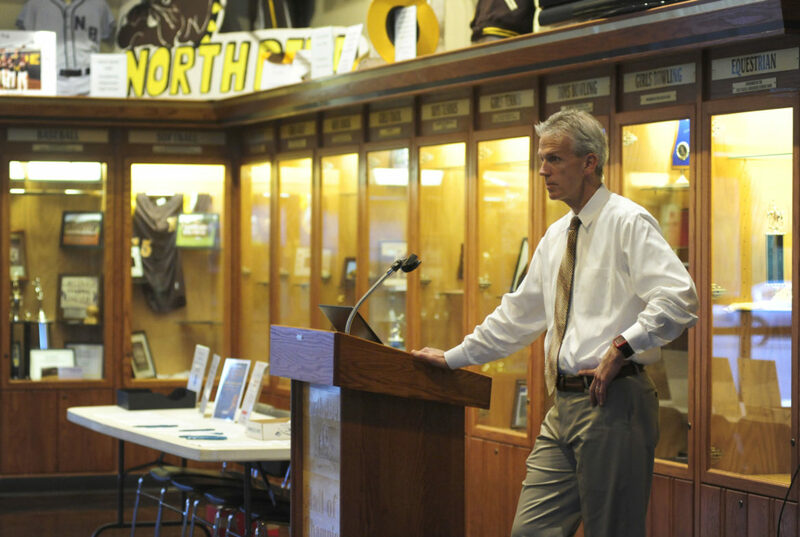 Mic Koester, pictured here giving a concussion seminar in North Bend in 2017, says he'd like to see small school districts in Oregon team up to share the cost of athletic trainers, to ensure that all student athletes in the state have access to medical care. When many people think of Hawaii’s charms, they envision idyllic beaches and fresh tropical fruit. Mic Koester thinks about high school football — particularly the presence of medical care on the sidelines. That’s because Hawaii is the only state to provide funding for athletic trainers at all public high schools, something that Koester and other sports health advocates would like to see in Oregon. Koester, an orthopedic doctor and member of the Sports Medicine Advisory Committee for the Oregon Student Activities Association (OSAA), says evidence clearly shows that athletic trainers help prevent injury and aid treatment, particularly of concussions. He and others say the ideal policy is to have athletic trainers working in every public high school in Oregon, regardless of size, as in Hawaii. Koester also thinks that the state should mandate that, in order to offer interscholastic sports, schools must have a certified athletic trainer as part of its sports staff. Funding for the positions would be included in the state’s school budget. The trainers would work full time, attend all practices and games, as well as provide treatment and rehabilitation from injuries. But creating and funding the positions in Oregon would be challenging. In Hawaii, there are only 43 high schools, overseen by one school district. In Oregon, there are 235 high schools under 198 school districts. And those schools range in size from large schools with more than 1,000 students to very small rural schools with fewer than 100 students. In Hawaii, lawmakers earmark about $4.3 million annually to fund two trainers in each school. Koester estimates that it would cost up to three times that figure to employ a single trainer in every Oregon high school. The exact dollar figure depends on a variety of factors, including the pay scale, whether trainers would be employed for 10 months or a full year, and whether the funding would cover all schools in Oregon, or only the schools with the largest athletic populations, between 3A and 6A OSAA categories. Oregon also is a large state with metropolitan population centers and rural, unincorporated communities. It’s easy to justify adding a full-time athletic trainer to the staff of a large school. But “from a funding standpoint, it is difficult to justify having an athletic trainer in a school with 50 kids,” Koester says. Wayne Miller, a retired teacher and the athletic director of Griswold High School in Helix, a tiny farming community in rural Umatilla County, says there is no way that his 1A school of fewer than 50 students would ever hire an athletic trainer without outside funding, or unless a member of the school’s existing staff sought training. “Would I like to have one? How could I say no?” he asks. Athletic trainers also attend sporting events in the afternoons and evenings, watching games from the sidelines and treating athletes on the field, Johnson said. There, documentation isn’t the easiest, especially for those trainers that don’t get much down time between treating athletes, or desk time away from their hands-on work with athletes. Angella Bond, an athletic trainer with Tuality Sports Medicine, says Tuality trainers, who serve five large high schools in Washington County, have 1,100 hours to divide annually among sports seasons. Generally, they are at the schools daily, covering all varsity, junior varsity and freshman sporting events and traveling for varsity football and occasional playoff games. While Bond said trainers occasionally treat concussions from “the swimmer that flip-turns and hits their head” or the occasional water polo or equestrian accident, they primarily see soccer, basketball and football players, along with some wrestlers, volleyball players and baseball players. In all cases, those trainers perform tests on the players right away, and also follow-up test them for concussion impacts, then either diagnose or refer them to a doctor. But in cases where a player is referred for additional services, there’s support from the institution there, as is the case when filing reports about those student interactions. Processes were similar at Portland Public Schools, where eight Providence athletic trainers cover events. Those trainers diagnose and document all suspected concussions, using a secure app to allow parents and coaches to report injuries. That’s in sharp contrast to the conditions for athletic trainers in small schools. Darren Shryock, athletic director and assistant principal at Stayton High School, said his rural Marion County school contracts with a health care facility, PT Northwest, for athletic training services at a deeply discounted rate of $10,500 a year. That enables the school’s trainer to work on a part-time basis. He arrives about 3 p.m. and stays through the day’s games, but has little desk time to document the work he does. Some small schools get creative. Shryock formerly taught at Silverton High School, where students could learn basic sports medicine as part of a grant program that funded a health occupation class. Offered both semesters, he said it enabled students to assist athletic trainers at that small Marion County district with basic care – like preventing injuries. “So when our athletes would go in, there would be someone to help tape ankles because the students had been trained to do that. It wasn’t one person trying to do everything,” he said. Koester and others, including Johnson, think it’s feasible to pursue what Koester calls a “co-op” model, where multiple small schools would contract with an athletic trainer, who would split time between schools. It’s similar to the work Dr. Derek Earl does in the Hermiston area, and how small private schools in Hawaii provide athletic training services (see sidebar). “Dr. Earl’s model is an excellent example of the type of system that we hope to replicate throughout that portion of eastern and frontier Oregon,” says David Kracke, a personal injury lawyer and Oregon’s brain injury advocate coordinator. Kracke also thinks there is potential in finding medical doctors willing to work as volunteer athletic trainers who, at the very least, would attend games. But it would be better than nothing — and potential lawsuits if a student became badly hurt. Yet funding, were it to come, might not be enough. Many rural communities struggle to recruit and hire teachers, doctors and other professionals — including athletic trainers. Newport High School won a $35,000 grant last year from the National Football League Foundation to help hire an athletic trainer and promote better health care for the school’s athletes in general. The local hospital also agreed to pay half the trainer’s salary in exchange for the trainer working at the hospital part time. A year later, they haven’t found anyone willing to move to the rural coastal area. “It seems like most of the trainers want to live in the valley, more an urban atmosphere,” says Joe Zagel, the high school’s recently retired principal. On the other end of the size spectrum, many of Oregon’s largest high schools already have an athletic trainer. They could easily use a second position, and Koester hopes any funding proposals would take that into consideration. “If (the district) is already funding the position and the state provides funding … ideally they would fund two,” he says. Shelly Jones, the athletic trainer at Oregon’s Aloha High School, says that, depending on the season and the teams that are playing, she cannot cover all the practices. In the spring, she often will observe the first half of a baseball practice, then move to a different field to observe the second half of a softball practice. To say that many athletic trainers are “stretched thin is an understatement,” Koester says. Even a second athletic trainer to help Jones cover practices, games and work with Aloha High students would “be an Earth-shattering, mind-boggling change for me,” she says. The most important factor in swaying legislators, Koester and others say, is showing that there is a financial benefit to having athletic trainers work at the school. Johnson says he and other researchers at OSU’s School of Public Health and Human Sciences are finishing a study that will analyze the cost savings associated with having athletic trainers in Oregon schools. The study, which analyzes claims data from private insurers and the Oregon Health Plan, which insures Oregon’s Medicaid population, is expected to be published sometime in 2019. Increasingly, the presence of athletic trainers in school is viewed as a public health issue that saves schools and parents money. Student athletes with access to an athletic trainer can avoid going to physical therapy, getting X-rays and other care, and reduce trips to the emergency room for treatment and care that athletic trainers provide to students without charging them. And it keeps kids in school, instead of missing classes for medical appointments. Johnson says the Oregon Athletic Trainers’ Society has worked with various school health programs that benefit the entire student population, not just athletes, on topics such as mental health, suicide prevention, anti-bullying and emergency action planning. Whether Hawaii’s funding for athletic trainers can be replicated in Oregon ultimately comes down to a question of values. “Oregon has been on the forefront of a lot of things on student health care,” Johnson notes, including passing Max’s Law and creating a sports medicine advisory group within OSAA. Emily Harris, Sergio Olmos, and Lee van der Voo and Jacob Fenton contributed reporting to this story, which has been supported by the Solutions Journalism Network, a nonprofit organization dedicated to rigorous and compelling reporting about responses to social problems, http://solutionsjournalism.org. At Junction City High School, Tye Rauschert wears a couple different hats. Rauschert is the Lane County school’s athletic trainer. Since the position is only part time, he also works part time as the secretary of the athletic department. His day starts at 6:45 a.m. Rauschert works in his secretarial duties until the end of the school day at 3:15 in the afternoon. Then he puts on his athletic training hat and heads to the field to observe practice. Depending on the season and how many sports are being played at one time, Rauschert cannot attend every practice. “You’re spread thin,” he admits. But all the coaches are educated in CPR and first-aid, and Rauschert always carries a cell phone and radio with him during practice, so he can respond quickly in case of injury. Junction City is one of 34 Oregon high schools with a 4A classification, where most enrollments fall between 350 and 650 students. Rauschert guesses half of 4A schools have an athletic trainer. An athletic trainer has been employed at Junction City High since 1988. Craig Rothenberger, the school’s athletic director, made it a priority, as did the school district’s superintendent. “Leadership at the top,” Rauschert notes, is where support for the existence of his position starts. Rauschert notes that his services are “free of cost” to the 476 students. “It’s a huge benefit to student athletes,” he says. Junction High’s training room is 342 square feet in size. There’s a whirlpool, ice pool, treatment table and room for rehab. There’s equipment that Rauschert would like to add — a new stationary bike, an ultrasound machine, and an electric stimulation machine, which can help control pain, help tissue heal, and help an athlete’s range of motion increase during rehab. “A lot of schools have it,” Rauschert says. But a small budget is one of many challenges that exist within rural communities. Rauschert is a graduate of Junction City High School, where he played basketball. When he graduated from Linfield College in 2005, he quickly found a job working at his high school alma mater. “In a rural setting, you can wear a lot of hats and not just be influential to (athletes) in their athletics and academics, but in their life,” he says. Rauschert says he talks to his student athletes about “everything” — from injury prevention to nutrition to managing stress. “I never want somebody to come back and say, ‘You never told me about that. You never educated me about that,’” he says. The student athletes also often confide in him about their lives at home, their struggles with anxiety, depression, peer pressure.